Make money with our portable Tiki Bars! Want a Portable Tiki Bar Business? Make great money working for yourself, from anywhere, doing something fun! Are you an Event Planner, Caterer, Bartender, DJ, Artist/Craftperson, Chef or other mobile services provider? Do you offer your services or products and want a fun, unusual, mobile set up to make you stand out? Our commercial grade portable Tiki Bars are very portable, high quality and set up in ten minutes. They break down into 3 custom carry bags. You can use one, two or three of them at a time depending on the size of set up you want. Combine two for an L shaped set up and three for a large U shaped set up. This gives you total flexibility. 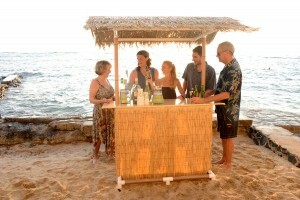 Own your own portable Tiki Bars and make money renting them out to others! We are expanding our rental network. People love to rent them for parties and events. You can buy one or more and rent them out to others! Offer to deliver and set it up then come break it down and pick it back up for an extra fee. Throw in bartending, catering or party decorations for additional fees. You can purchase with zero down financing and no interest/payments for 6 months if you pay it in full at the end of 6 months with PayPal Credit at checkout. If you rent it out a few times a month it could pay for itself and then be a pure money maker. The Paradise Package is our commercial package. It comes with three custom carry bags, wheels and an extra shelf. We look forward to helping you make money with our portable Tiki Bars!